While you are visiting us on the water this summer, it’s important to remember to protect your skin from the strong UV rays. We all need some sun exposure since it is the top source of vitamin D, which helps our bodies absorb calcium for stronger, healthier bones, but too much sun exposure can lead to serious consequences. Overexposure can cause sunburn, premature aging of your skin, wrinkling and skin cancer. 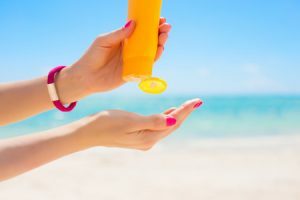 According to the American Cancer Society, shielding your skin with clothing, wearing broad-spectrum sunscreen with a sun protector factor of 30 or higher and staying in the shade can help lower your risk. We want you to enjoy all that summer has to offer without the painful sunburns. When you are packing for your upcoming canoe trip with us at Mattice Lake Outfitters, don’t forget to pack sunscreen and sun protective clothing. Are you interested in planning a canoe or fishing trip in Wabakimi Wilderness Park and the Albany and Kopka Waterway Parks? Let us help you! If you are interested in what packages we have created, please call us at 1-800-411-0334. We are looking forward to helping you create memories that will last a life time!